Ayopa Games is definitely one of our favorite publishers here at TAS. Not only do they have fantastic customer service and release high-quality games, but they’re very interested in listening to the gaming community, and so are the games developers; always trying to make their games better by tweaking controls, squashing bugs, fixing issues, and just listening to the general feedback from the players. Almost every Ayopa release (W.E.L.D.E.R., Chicken Rescue, BigBot Smash, M.U.S.E., Dungeon Crawlers and Mailmen) has been quickly updated to fix any problems or issues gamers brought to attention. They are also still being updated with more content, iCloud support, more fixes, changes, optimizations, or in some cases, being made Universal. 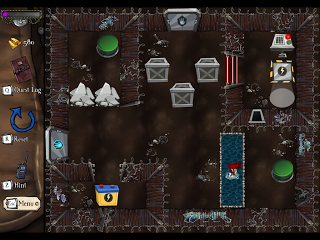 Well, Ayopa’s latest release, MacGuffin’s Curse, from developer Brawsome, who won Freeplay’s “Best Australian Game” in 2010 for the PC+Mac title Jolly Rover. It’s slated for release on the 19th of this month for the AppStore, MacStore, and Steam. 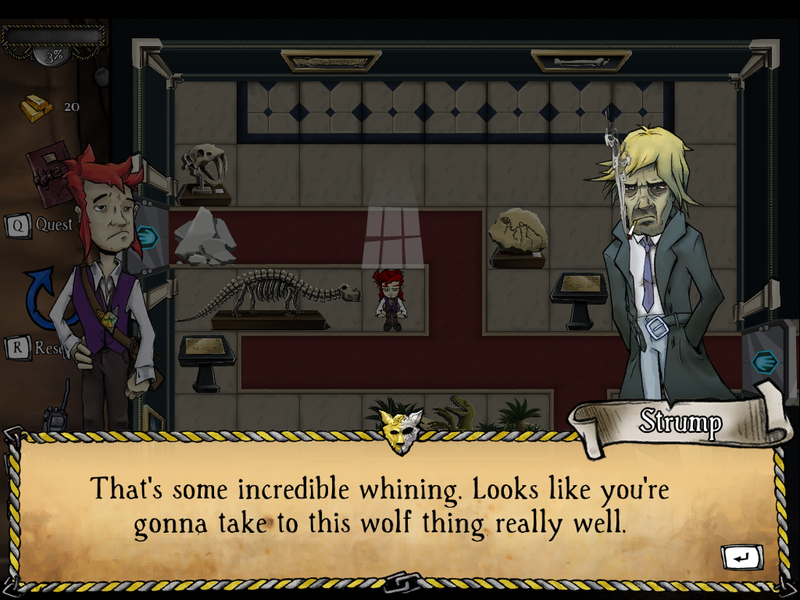 In MacGuffin’s Curse, you’ll be playing as Lucas MacGuffin, a magician-turned-thief who’s desperate to come up with the rent he needs to keep his daughter and mother under a roof. In this state of mind, he decides to rob the town’s museum of their ancient amulet. While trying to find a way into the building, an ex-detective stops MacGuffin, and forces him to agree to steal the amulet for him. After grabbing the amulet and putting it on, MacGuffin finds out that the amulet is cursed, turning him into a werewolf, and sealing itself to him, making it unable to be pried off by anyone. Now, with the city in total lockdown mode, MacGuffin still needs to find a way to come up with the rent, figure out how to get the amulet unstuck, and stop a criminal mastermind in the process. Along his journey, MacGuffin is able to switch between wolf and man when in the moon-light, needing to switch between both to smash through rocks that are in the way and move around large batteries and crates, as well as slide through small holes, pick locks, and activate doorways. 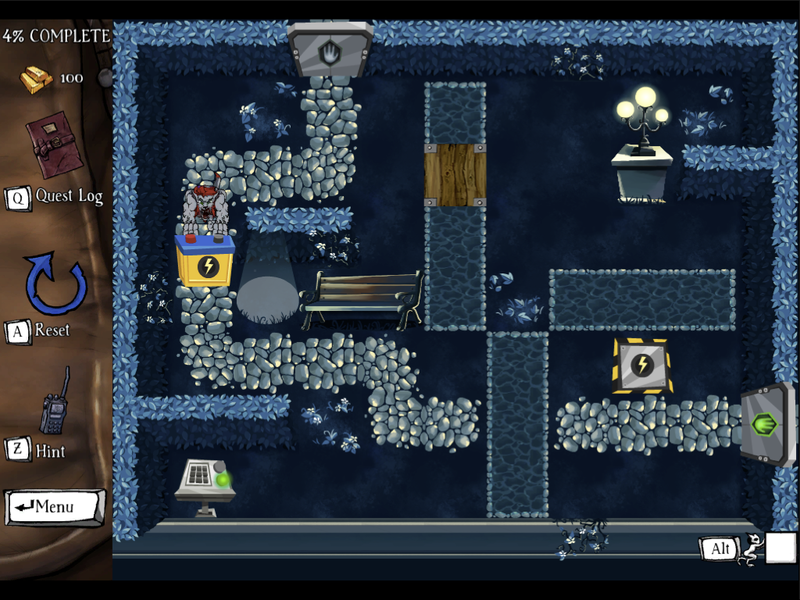 Graphics-wise, MacGuffin’s Curse isn’t really anything that shows off the potential of the iDevice, but they’re far from cheesy. The environments are well detailed, and the animations for walking, and moving objects look great, and once you get into the game, the graphics really end up fitting the gameplay. The atmospheric BGM also helps add to the feeling of the game, as do the great sound effects. There’s not one point where I was caught off guard by an annoying sound effect that totally took me out of the mood the game put me in. The controls are decent enough to fit the gameplay, but a d-pad and action button would have been a nice addition as well. To move your character, you’ll need to swipe and hold in the direction you want to move. If you want to make single step moves, a short quick swipe will get it done. A single tap anywhere on the screen will activate buttons, view different objects or use doors, while using two fingers to swipe will push and pull larger objects. 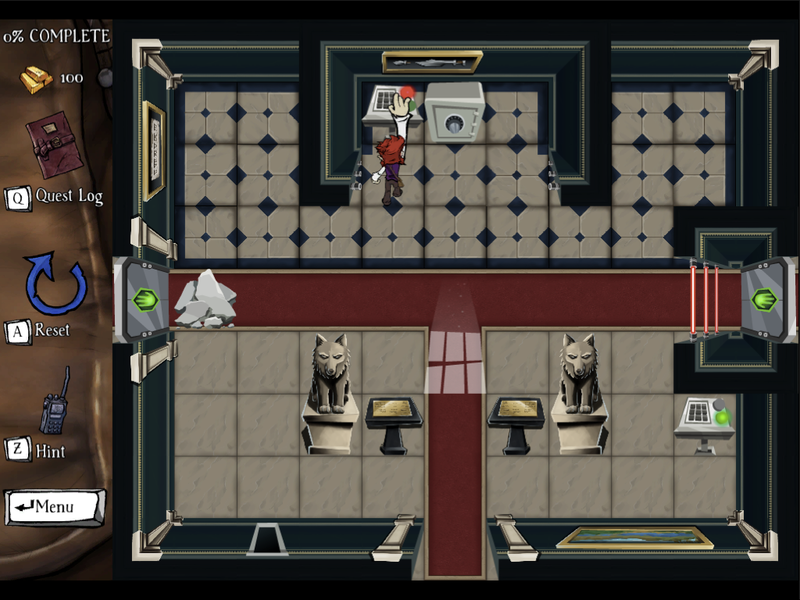 You’ll move from room to room (or a screen sized section of the city), solving puzzles to move onto the next one. They will usually require you to find a way to a power button, which will give you access to a battery, which you’ll then need to find a way to drag to the battery holder, finally opening up a door that will lead to the next room. As you progress through the game, more features are added, like large buttons which you’ll need to hold down with crates, steel crates which can only be pushed and not pulled, piles of rocks that will block off areas, and more. There’s also safes which house gold, as well as bits and pieces of a comic which tells the story of MacGuffin. Throughout the city, you’ll also run into some pretty interesting characters, some of which will get in your way, while others will have quests for you. You’re given a quest log which will help you keep track of them, and not too far into the game, you’ll come across a character which will give you the ability to jump to certain places on the world map that you’ve already visited. Most of these characters and the conversations that MacGuffin has throughout the game, as well as the little dialogue sections when you check out various objects in each of the rooms, can add quite a bit to the gameplay. Sometimes you’ll come across a helpful hint, while other times it’ll just be there to help add some humor to the gameplay. Either way, the writing is definitely something that sets this puzzler apart from the herd. 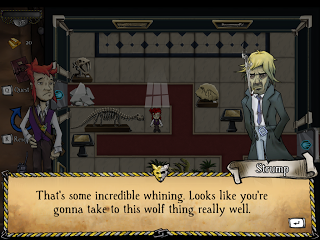 MacGuffin’s Curse will be available on the AppStore, MacStore and on Steam April 19th. At $4.99, being Universal, and including GameCenter support with 18 achievements that will require you to do quite a bit of exploration, it’s a puzzler that fans of the genre or tongue n cheek humor won’t want to pass up. I haven’t come across any issues as of yet, no problems with sound cutting out when coming back to the App from the multitasking bar, not one crash, and no glitches to speak of, but since it is published by Ayopa, I’m pretty sure you can bet that if any issues are found, the developers will be ready and willing to jump on fixing them ASAP.